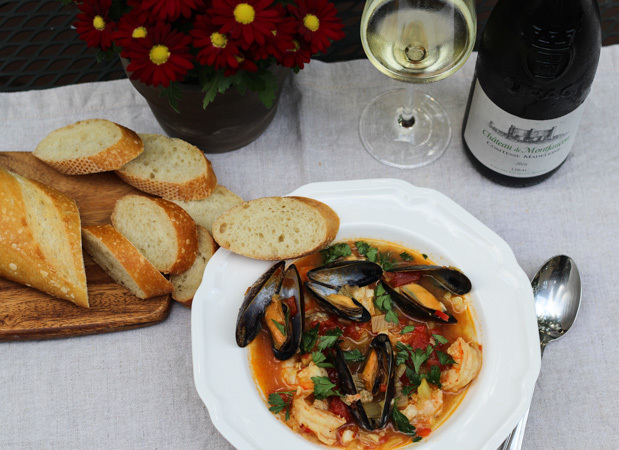 The Mediterranean flavors of Bouillabaisse; saffron, anise, tomatoes, garlic, orange, and of course a taste of the sea in a variety of fish make for the perfect pairing with a southern Rhône white wine from Lirac. Lirac (map) is an appellation in the Southern Rhône Valley only 10 miles northwest of Avignon, on the right bank of the Rhône River. The climate in Lirac is Mediterranean with lots of sunlight (2700 hours annually), low rainfall (only 27 inches annually), an average temperature of 57 F, and the famous “Mistral” northern winds that help circulate air through the vineyards keeping them healthy. Marsanne – Full-bodied, rich texture, depth of color, and medium-low acidity. Flavor notes roasted nuts, pears, peaches, honeydew melon, flowers, and spices. Viognier – Full-bodied, medium-low acidity, and lush, soft character. Highly aromatic with notes of peach, pear, violets, and minerality. Grenache Blanc – Full-bodied, low acidity, medium aromatics, and a long finish. Clairette – High in alcohol, low acidity with flavor notes of fennel, apple, lime, apricot, and peach. Bourboulenc – Good acidity, low alcohol, fruit, and floral notes, depth of color. Picpoul – Full-bodied, high acidity with lemon flavors, adds to the overall blend. Disclosure: The wine was provided to me as a media sample. All opinions are my own. Bright pale gold in color. Medium acidity and body. On the palate a creamy mouthfeel with notes of citrus, pear, fennel, and mineral notes. Chateau de Montfaucon is a 111-acre estate located across the Rhône River from Chàteauneuf-du-Pape. It is owned and operated by Rodolphe de Pins, a UC Davis graduate. This wine is named after his grandmother, Comtesse Madeleine, who managed the estate for over 60 years when she inherited the Montfaucon castle from her great-uncle Baron Louis de Montfaucon. Vinification: The grapes are whole-bunch pressed. After the juice has naturally settled, it is racked, fermented, and aged in French oak barrels on its lees for six months. Regional Pairing – If it grows together it goes together. 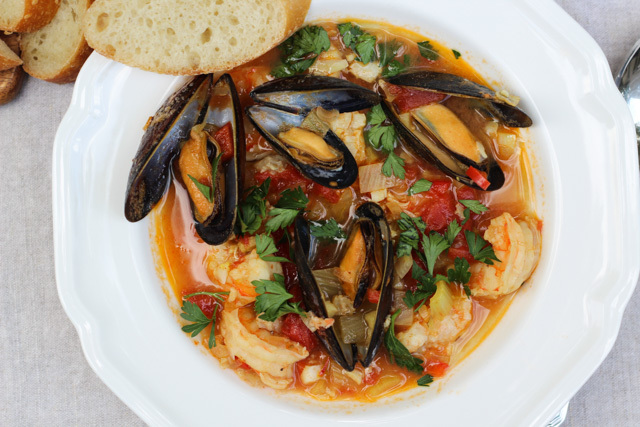 Bouillabaisse is a classic fish stew from southern France. Matching Flavors – Both the wine and Bouillabaisse have flavor notes of anise, citrus, mineral/salt. Matching Acidity – The wine and Bouillabaisse are in balance with the acidity. Matching Texture – The wine has a creamy mouthfeel which is echoed in the texture of the cod and shrimp. Intensity Match – Both the wine and Bouillabaisse have the same flavor and weight intensity. Bouillabaisse a Provencal fish stew originating in Marseille pairs nicely with a southern Rhône Lirac Blanc. In a large Dutch oven, heat the olive oil over medium heat. Add the onion, bell pepper, fennel, saffron, and Piment d' Espelette and sauté for about 15 minutes, stirring occasionally. Add the garlic and sauté for 30 seconds, stirring. Add the wine and Pernod. Bring to a boil and cook for about 2 minutes. Add the seafood stock, tomatoes, orange zest, orange juice, 2 teaspoons kosher salt and 1 teaspoon black pepper. Bring the mixture back to a boil and then lower heat to a simmer. Cook for 25 minutes uncovered, stirring occasionally. Remove and discard the orange zest. Gently stir in the cod or halibut and shrimp. Increase the heat and simmer for 5 minutes uncovered or until fish JUST begins to flake. DO NOT STIR. Add the mussels on top, COVER, and simmer for about 5 minutes or until the mussels open. Discard any unopened mussels. Serve in large shallow bowls, sprinkle with chopped parsley, and french baguette slices. That looks delicious! You’re making me hungry…and wishing that I had had a white Lirac to try. Cheers. I’d love to make this dish — a classic that I generally consider an in-France restaurant treat. Bookmarking! Oh my gosh, I can’t wait to try this recipe. Your bouillabaisse looks delicious and maybe a bit less trouble than the traditional one. Bummed to miss Lirac this month, but I’m actuated to go find a Lirac Blanc and make this Bouillabaisse! You featured one of my favorite wines and producers and your pairing is totally on point. Looks amazing. Well done. What a fantastic recipe! And your pairing information gives a great base for pairing wines in general, finding matching flavors, textures, intensity and weight! 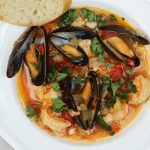 Love your review and the bouillabaisse sounds like s perfect match for the wine! 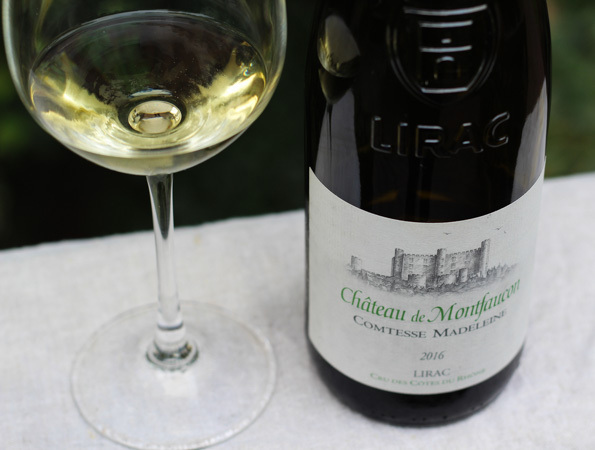 I’ll definitely be drinking a Lirac blanc soon! Love that dish! And I can imagine it with the Lirac blanc — and maybe with a rose? Rosé would also make a nice pairing. Sounds delicious! Nice job of breaking down what makes this a great pairing too.